Prince Rupert and Port Edward | Turning my world upside down! When I was a teenager, Cannery Row in London was synonymous with high fashion. Of course I had never heard of a cannery, being francophone and all, so I just thought they were mispronouncing Canary. I figured the street was full of nice birds. The day after we arrived in Prince Rupert, we started our tour with the North Pacific Cannery in Port Edward. My friend Marlene had grown up there and did work in a cannery in the area, so I assume it is the same one. It was opened in the late 1800s and was one of the largest fish processing plants in BC. In the early years, they hired First Nations employees, Chinese and Japanese workers, along with white employees. The premises reflect the segregated housing, when a family of Aboriginals lived in a small house over the water. The Japanese were housed at the other end of the complex as they had their own lifestyle and way of fishing. Some of the employees were fishermen, some worked in the cannery, some worked on repairing nets. Of course there were managers and an accounting staff. At its peak, the cannery had about 1200 employees living and working there. They worked the season with no pay until the end of their contract. In exchange they were given a place to live and access to credit to buy goods from the company store. At times, some of the Chinese employees who spoke no English were overcharged for their purchases. I’ve read about the practices of the Hudson Bay outposts and didn’t find much difference in their practices. The cannery is now a National Historic site. It was closed in the early 1980s. The group that manages the museum is trying to secure a Unesco World Heritage rating so they can refurbish the buildings that remain. Unfortunately, many of the original buildings have simply fallen into the Skeena River and washed away. Leon and I stopped for a cup of tea and some fried bread with syrup to warm up in the rainy morning. We tried to find Marlene’s family house as we left the Port Edward, but I am not sure it’s the right one as the addresses don’t exactly correspond to what she told me. Ones of the many building right close to the train track for easy transportation. The Japanese workers lived at the far end. The large building is where they repaired the nets. 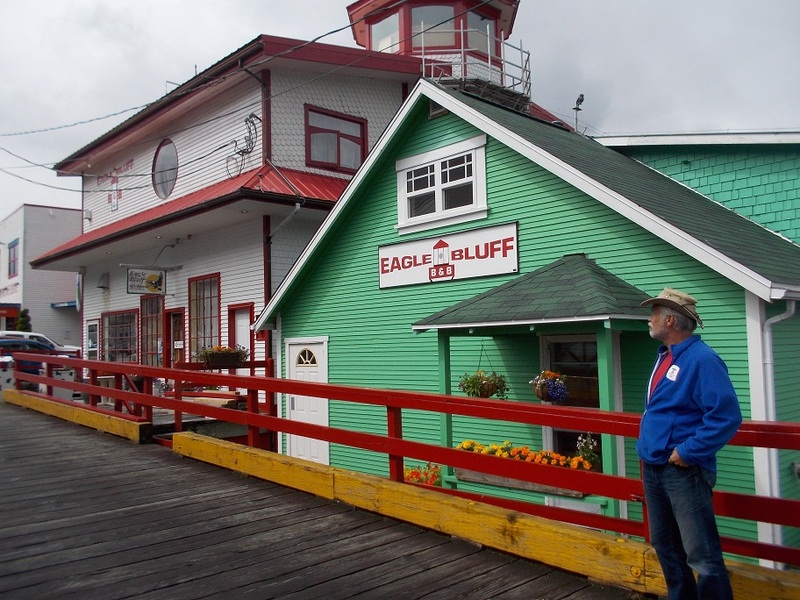 We drove the 15 km back to Prince Rupert to visit the trendy area of Cowbay. This part of town is named for the cows that literally crossed the water in that area in bygone days. Today, it’s the sight of many shops and cafés. We dipped in for a visit to some of them and bought a few things. I have to mention that the weather was typical of Prince Rupert, mostly rainy, foggy with a slight clearing of the skies. They call this place the city of rainbows. We didn’t get to see any rainbows but then we didn’t get much sun. So we thought we may as well slip into the local museum and see the exhibits regarding this area and the First Nations. The Museum of Northern BC is housed in a lovely longhouse style building. It’s a style I admire greatly and wish we could have something similar for our great room in our own home. All we would need is that great room, a bedroom and a bathroom. We’d be set! I doubt we could afford the windows, let alone the whole structure.